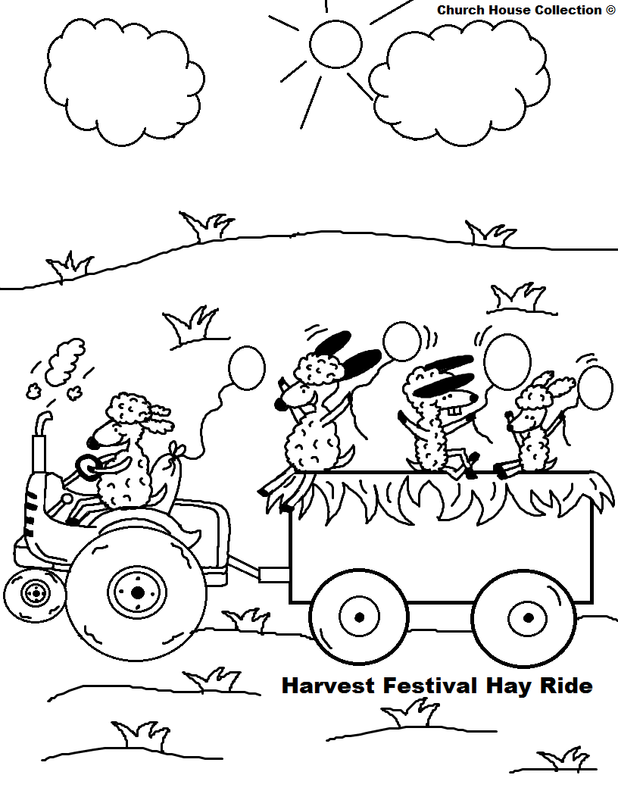 Here is some fun and really easy fall festival games for you to put together for the younger children. 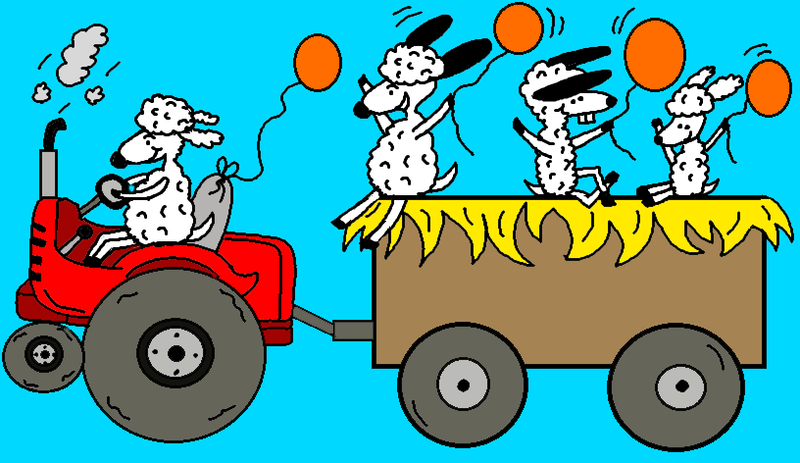 Oh, and if you like the little sheep driving the tractor picture that you see up above and want to print the coloring page version of this out then here is the link. Okay... now on to the games below! 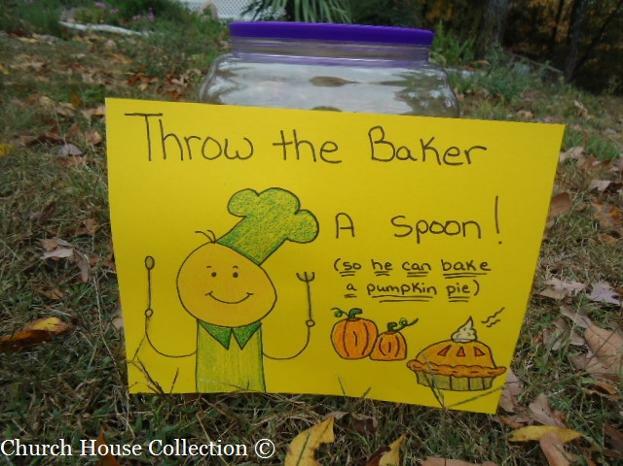 "So He Can Bake A Pumpkin Pie"
I just made this game up... I went online and was looking for a baker picture that I thought was cute so I could draw it on some yellow construction paper and I found one and just drew it on the paper by looking at it online. I also drew two pumpkins and a pumpkin pie on the paper. 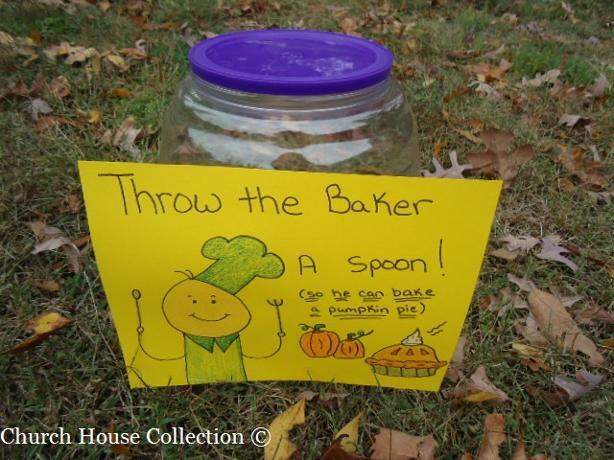 This game only requires plastic spoons and some kids! Just have the kids line up behind a line that you put on the floor by using some duct tape. 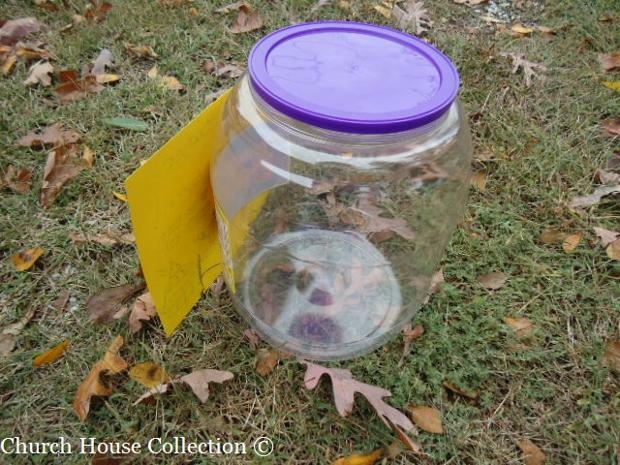 Have them try tossing the plastic spoons into the plastic jug. This is an empty Cheetos ball container. I got this from Walmart. Just take the lid off and let them see if they can get a spoon in. When they got a spoon in they got to pick out a prize. We had small prizes we offered that we got from walmart in the party section. We also had some candy too. 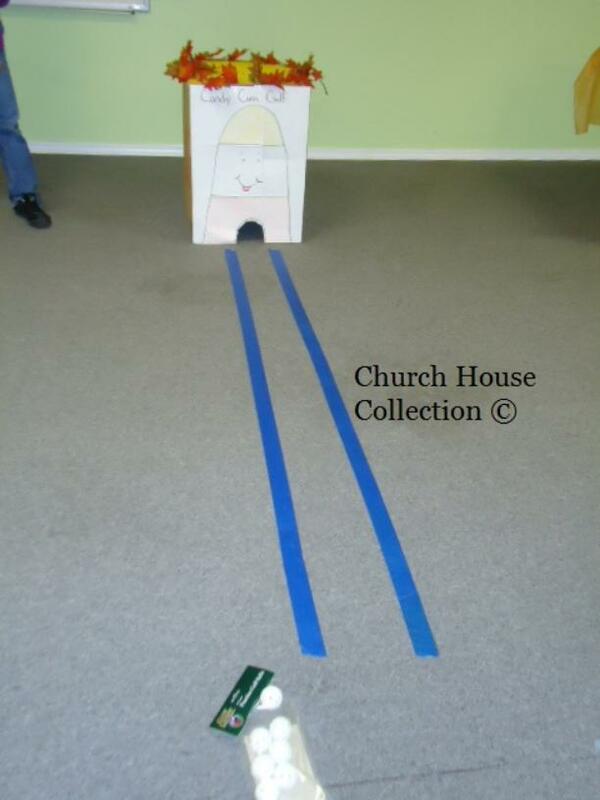 This is not really a game, but just an idea for a church fall festival. 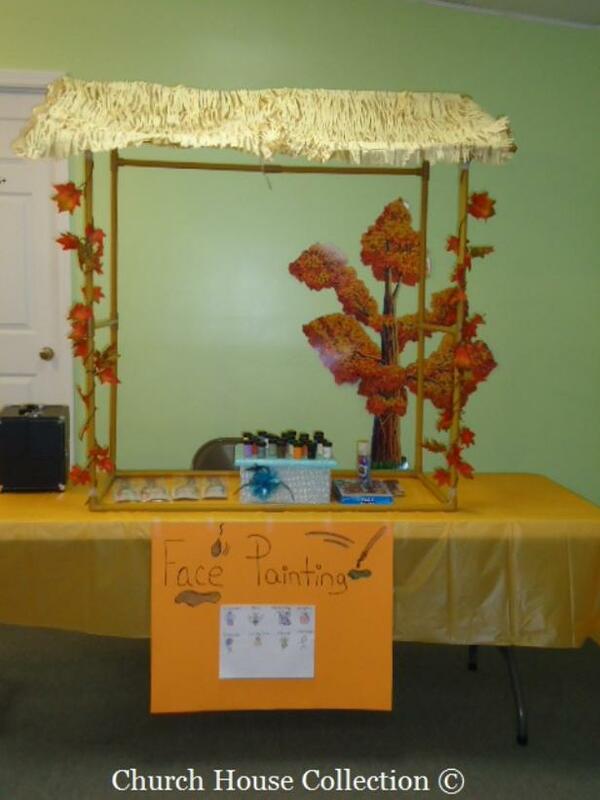 You could paint crosses, pumpkins, corn, anything harvest like on the kids faces. Or you could do little animals like bees, butterflies, cupcakes, balloons, ice cream, flowers, etc. The paints and paintbrushes I used were purchased from Walmart. You could also use eyeshadow palette's to fill in for a color and use a black eyeliner to draw with if you don't want to use paint. I found that using makeup eyeshadow and eyeliner is a lot easier to draw with. I covered a table in an orange table cover and set a table hut thing (Not sure what its called) on top. I got this from oriental trading for a hawaii party and I just changed the flowers out. I used fall vine leaves from the dollar tree and wrapped them around the two front poles and taped the top and bottom so they wouldn't fall off. I bought an orange poster board and wrote the word "FACE PAINTING" on the top and drew some paintbrushes dripping with paint. I taped a white piece of paper to the front with some little animals and characters that I offered the kids to draw on their faces. I just taped the orange poster to the table. 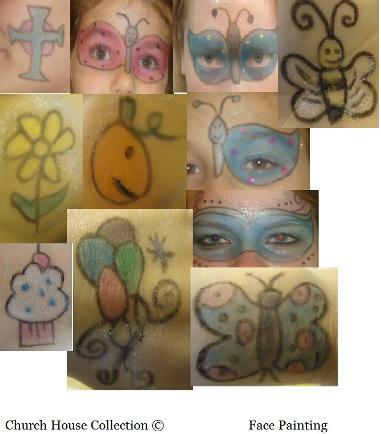 (However, I was getting more custom requests than anything, lol) The kids wanted huge butterflies that covered their eye on one side. Some wanted both eyes done. Of course I had a glitter stick to add some glitter to the face painting when I was done. They turned out okay. I am not a professional in that department by any means. You could also use stencils if you can't do this very well. Or watch some tutorials online and see how to do some. 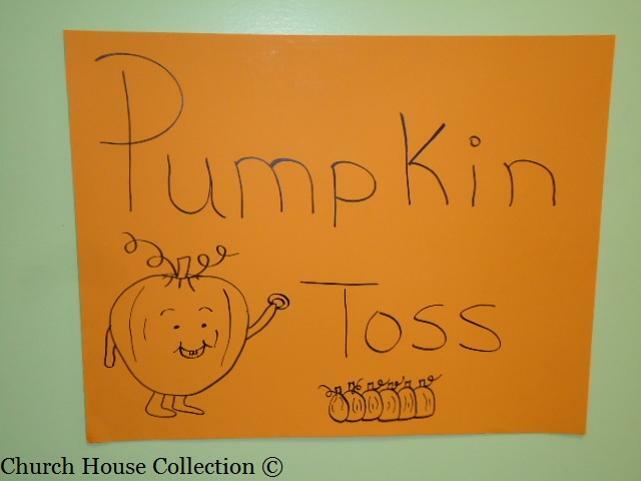 I bought an orange poster board and wrote "Pumpkin Toss" on the front of it. 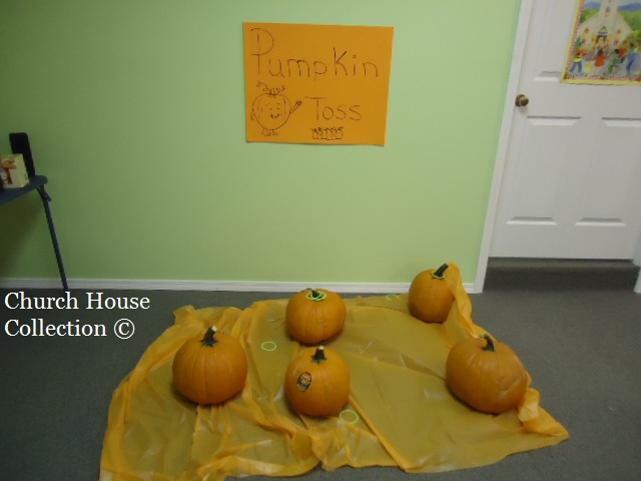 I drew 6 small pumpkins and one large pumpkin holding a ring toss on the poster board. I taped this to the wall. We put tape down on the floor for the kids to stand behind. 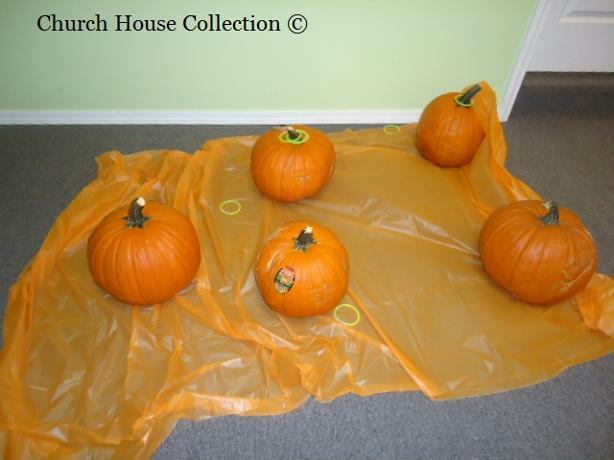 I bought 5 large pumpkins from Walmart and an orange table cover to set the pumpkins on. We bought 2 packages of glow in the dark bracelets for the kids to toss onto the pumpkin stems. This is a little hard so you might want to give them about 6 tries. We had debbie cakes for prizes on this one. When the kids got a ring on the stem they got to pick out a debbie cake from the table. I took a cardboard box and covered the front of it only by taping on white computer paper to the front. I put some tape to the inside so you couldn't see it but on the right hand side I put a piece of big tape and I don't know what I was thinking because I forgot that I had to draw a candy corn on the front of this. And if you know how tape works then you know that you can't draw over tape. It won't work. So make sure you put the tape to the inside when you do this. 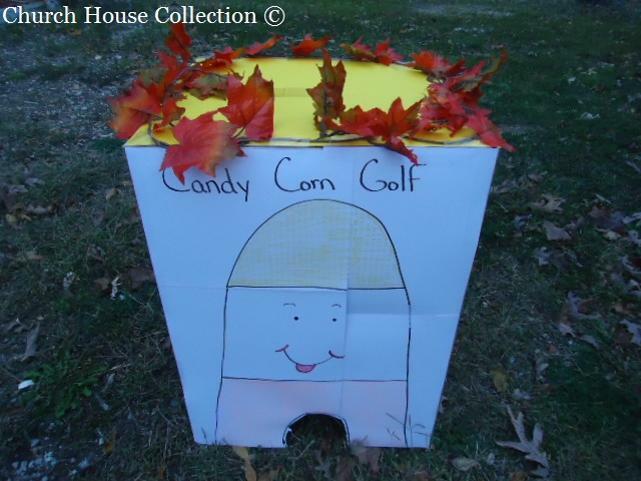 I drew a large candy corn on the front and colored it in. 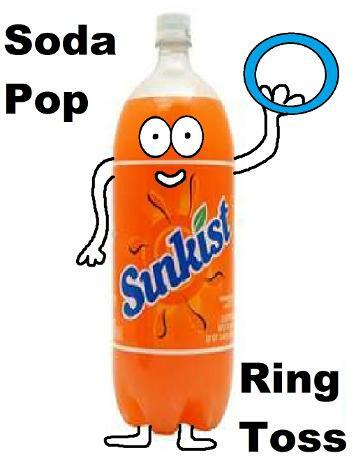 I used Yellow for the top of his head and left the middle white and the bottom orange. I took some scissors and cut a little hole at the bottom for the golf balls to go into. I taped yellow construction paper to the top of the cardboard box and tape two fall vines (from the dollar tree) to the top of the box. Then we put tape down for the kids to stand behind it and see if they could get the plastic golf balls (we got from walmart) into the hole. Use a golf club and if you don't have one borrow one from somebody. I bought a large bag of Reeses, a large bucket of bubblegum, and some tear off tickets that have duplicates (from walmart of course). 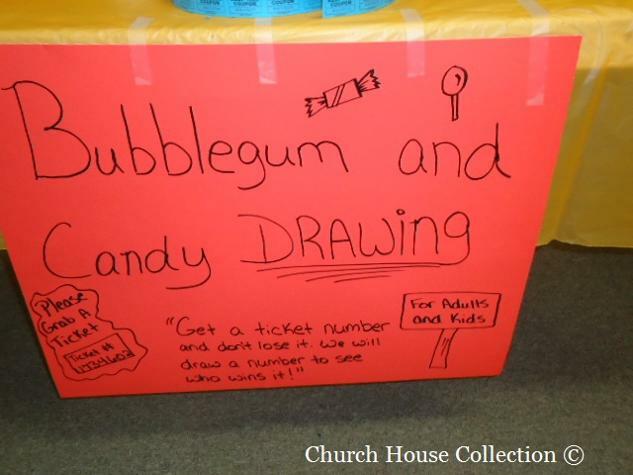 This drawing was for Adults and kids to win the bag or Reeses and also the bubblegum. We did two drawings- one for the bubblegum and one for the bag of candy. We tore the ticket off and handed it to the adult or kid and put the duplicate into the plastic cup I had setting on the table. At the end of the night we drew to tickets out to see who won. We also had balloons and set the air tank up on the table for anyone who wanted a balloon. I covered the table in an orange table cover and taped a red poster board to the front of the table. I wrote "Bubblegum and Candy DRAWING" on the front. 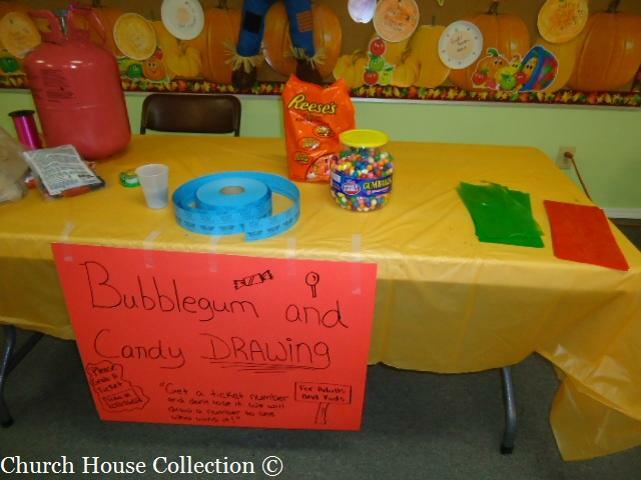 I drew some candy pieces on it and I also drew a small sign that said "For Adults and Kids". I also wrote "Get a ticket number and don't lose it. We will draw a number to see who wins it!" "Please Grab A Ticket" and I drew a small ticket on the left with numbers on it. This one didn't last long at all. 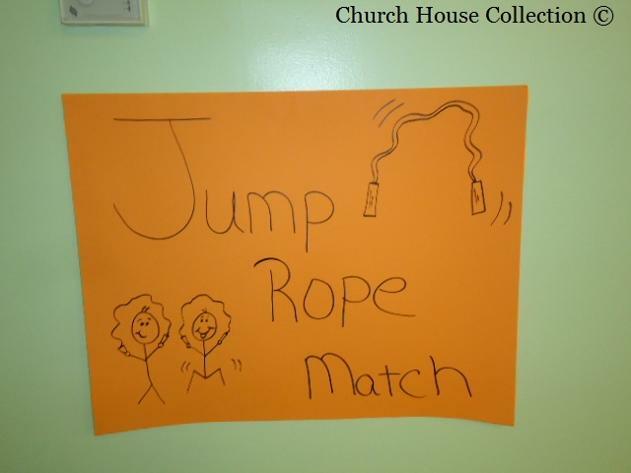 The cheap jump rope we bought broke before it even really got started. We bought two jump ropes for the kids to go against each other and see who can jump rope the longest. The winner gets a prize or some candy. Too bad this didn't work out. Filled With Chicken Noodle Soup!